At the official exchange rate, Venezuelans pay 5 cents a gallon for premium gasoline while the real price is closer to one half penny a gallon. The dark purple country at the northern tip of South America (below), Venezuela has the cheapest gas in the world. 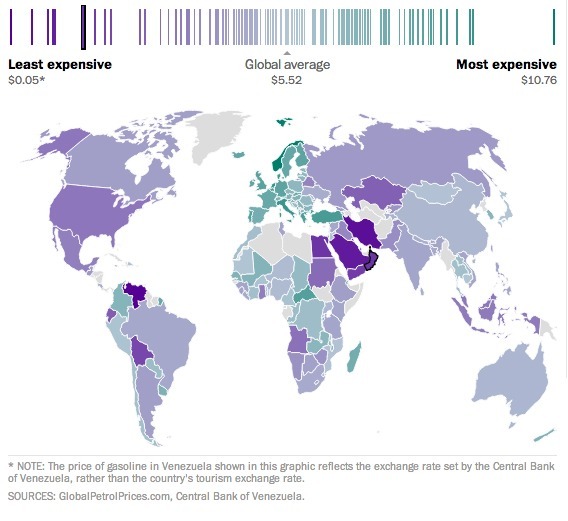 In nearby Colombia gas is $6.88, and across the Atlantic in (dark green) Norway a gallon of gas is $10.76. Even for oil rich Saudi Arabia, the price is $.78 a gallon. With break even estimated at $1.62 a gallon, the Venezuelan government is spending a lot to subsidize the price of gas. Add to that the pricer US gasoline that Venezuela had to import because of their refinery problems and you have a very expensive subsidy. This takes us to cars. During February, Toyota announced that it was having difficulty bringing auto parts into Venezuela. No parts mean no new cars. And, with Toyota selling 291 cars out of a total of 296 in the entire country, you can see that production has been miniscule. Toyota’s problems, and GM’s and Ford’s too, relate to President Nicolás Maduro’s foreign exchange policy. Whereas black market dollars are upwards of 80 bolivars, Maduro has officially underpriced them at 6.3 bolivars for necessities and 11.4 for all other goods and services. Like a price ceiling, the result is a shortage. Without the dollars, firms cannot buy imports. However, President Maduro says having cars for his country is a priority. How to assure that people get them? He said he will require lower prices for all new and used cars. Perhaps more logically, he also announced a third foreign exchange rate that would be market-related. Combine government subsidies for gasoline with price ceilings on everyday goods, on foreign exchange rates and on profits and you get a mixture of perverse incentives. December 2013 statistics indicate that demand and supply have responded with annual inflation above 50% and shortages ranging from milk to toilet paper to newsprint. In addition, you wind up with a country that has fewer cars for its ridiculously cheap gas. Sources and Resources: With each article having a slightly different focus, the news about the Venezuelan economy adds up to the story of regulation gone amuck. For gasoline prices, the Washington Post had the graphic and the facts while for auto production and gas, it was Reuters and the NY Times. The one academic paper I read focused on how much the rich and the poor benefited from Venezuela’s gas subsidies. Next ArticleWhat is the Price of a Rain Forest?